This brick red complex is a perfect example of the typical eclectic residence-museum very much in fashion at the end of the 19th century. Along Via Giuseppe Orlandi, Anacapri's main street lined with whitewashed houses and local shops, sits the bright red facade of a building, architecturally unique among its plain-faced traditional island neighbors for its strange and fantastic decorations. This is Casa Rossa, built between 1886 and 1899 by the eccentric American colonel John Clay MacKowen (1842 - 1901) alongside an Aragonese tower dating from the end of the 1400's, and representing a perfect example of the typical eclectic residence-museum which was very much in fashion at the end of the 19th century. The unique structure of the complex, the blend of architectural styles, the bright brick red color, and the marble fragments which adorn both the inside and outside of the building, make this one of the most interesting residences on the island, and reflect the multifaceted personality of the original owner, veteran of the American Civil War, physician, bibliophile, lover of archaeology, and author of the first monograph on Capri, published in 1884. A few years after the end of the Civil War, John MacKowen emigrated to Munich in Europe, where he completed his studies in medicine, obtaining his degree in 1876. From here, he moved to Capri, where he lived with a young local woman, Maria Cimino, with whom he had a daughter named Giulia. On the island, he was known for his volatile personality, and the locals soon dubbed him "ciacca e mmereca", a nickname inspired by his quick temper but deep generosity. He did, however, make many long-lasting and deep friendships over the years, both with islanders and with the many artists and intellectuals who had made their home on the island, forming a large expat community on Capri at the end of the 1800's. The entrance to Casa Rossa, under the Greek inscription "Greetings, citizen of the land of idleness", leads to a covered courtyard where there are a number of archaeological fragments from excavations on the island and beyond, among which the statue of a priestess from the 1st century. Among the most interesting details of the complex is the covered staircase, topped by a majolica cupola inspired by the traditional style of the external staircases on island homes, and which is used to connect the different rooms in the residence. The complexity of the floorplan and the slightly disorganized design of the home is testimony to the fact that the building was built over a long lapse of time and in pieces, and it is thought that the hands of a number of local builders and architects were involved. 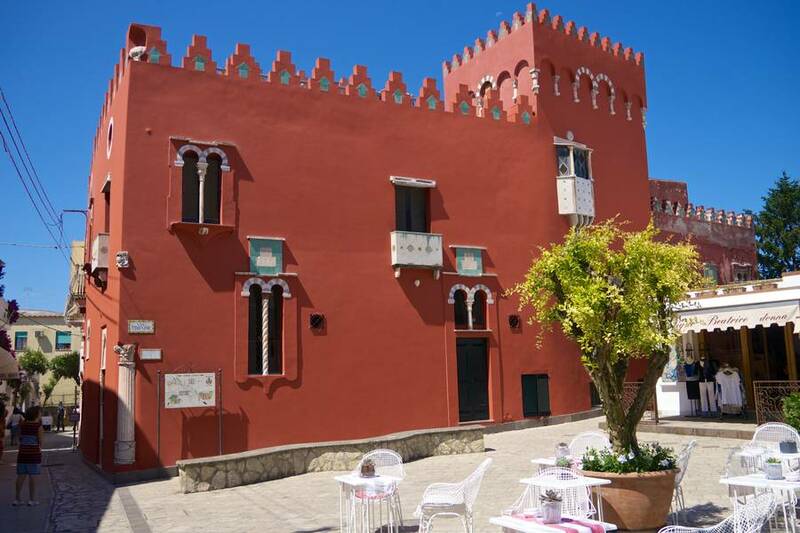 Despite this, the very blend of styles of Casa Rossa is what makes the complex so interesting architecturally, and the mix of different elements, including Classical columns, Moorish windows, Oriental crenellations, and Medieval-style details, forms an organic whole, and captivates visitors with the romantic and eccentric vision of Capri which has charmed tourists to the Azure Isle for centuries. This look at the past is not limited solely to the building, but extends to the complex's contents. Since 2003, the Isola Dipinta exhibit has displayed paintings of Anacapri from the 19th century and is the perfect opportunity to see the island as travellers on the Grand Tour in the last century did, and fellow Italian artists who discovered this magical place alongside them. These simple yet elegant scenes of daily life, including "La ristoratrice" or "Il Matrimonio" by the French artist, Sain, or the lanscapes by brothers Gonsalvo and Gabriele Carelli, will transport viewers, if even for a moment, back a century in history. To go even further back in time, pause before the four Roman nymph statues found in the Blue Grotto. Discovered on the floor of the most famous sea cave on the shore of Capri around 50 years ago, these statues are a gorgeous testimony to the presence of the Emperor Tiberius on the island, who chose Capri as his favorite private residence from 27 to 37 AD, and covered the island with splendid villas, temples, and places to practice "otium", or the quiet contemplation of arts, letters, and philosophy. Casa Rossa, however, is not merely a place where visitors can meander through history. During its opening season, the musuem organizes a variety of cutural events, temporary exhibits, and special hours so visitors can discover the lesser-known yet authentic and interesting, facets of the island's history and traditions, all part of a history more than a millenia long.